The food and agriculture industry is one of the most highly regulated sectors of our economy. There is a law, rule, regulation, standard or guidance that covers just about everything that goes in or on food packages. That’s why most consumers are surprised to learn food product expiration dates (with the exception of infant formula) are entirely voluntary. Although the Chiu bill has gotten the most attention, a legislator in Maine is pursuing a similar proposal. These efforts should not be easily dismissed, as we have seen how a single state like Vermont can dictate food policy to an entire nation, as it is doing with genetically engineered (GMO) food labeling. The question is not whether a uniform national standard for food expiration dates is on the horizon, the question is whether government or the private sector is best positioned to address the problem. 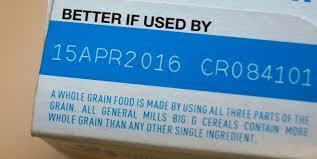 There are a lot of good reasons to pursue a national standard when it comes to food expiration dates. Consumer confusion and food waste come to mind, but this is not an issue that rises to the level of government intervention. Consumers want clear, actionable information. Food companies want happy, informed and loyal consumers. This scenario sets up perfectly for a voluntary, industry-developed on pack solution that can be supported by additional information on the World Wide Web if necessary. Government is completely out of its depth when it comes to understanding the fast moving consumer goods marketplace – and interpreting and acting upon consumer research. For those who don’t entirely trust industry to do the right thing, industry’s effort on this issue, currently under way, would earn the trust of consumers and government if it is developed in collaboration with a credible non-governmental organization and its marketplace implementation is verified by the same group. That approach will quickly put an end to consumer confusion, bolster consumer trust and leave government to deal with a plethora of serious 21st Century food policy issues that need to be addressed.